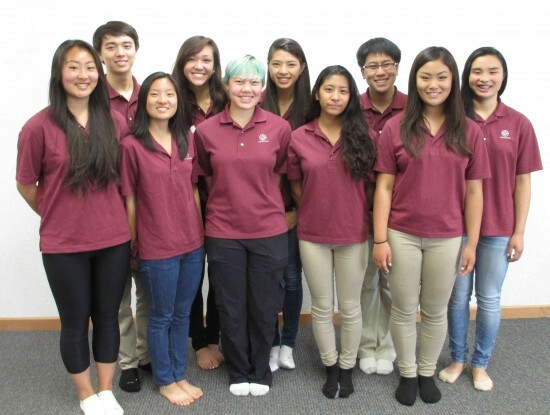 From left: (front row) Claire Nakamura, Tai Iwamasa, Jessi Svoboda, Kai Wong, Mika Osaki; (second row) Andrew Nielsen, Aislinn Ozawa-Burns, Tae Shimamoto, Wesley Yee, Riki Eijima. SAN FRANCISCO – Ten high school student members of the Takahashi Youth Ambassador Fellowship Program organized by the Japanese Cultural and Community Center of Northern California and sponsored by The Henri and Tomoye Takahashi Charitable Foundation will embark upon a 12-day trip to Japan this weekend. The Takahashi Youth Ambassador Fellowship Program, in its third year, is a follow-up, after 13 successful years, to the Shinzen Nikkei Youth Goodwill Sports Program. The structure of the Takahashi Program is based on the best practices, experiences, opportunities and activities of the Shinzen Program, but focuses more on the leadership and civic development of youth to build a strong background and foundation for their future endeavors. This program is invaluable in not only helping the youth in the Japanese American community develop and define their identity, but also help creates future leaders for the community, organizers said. The 10 chosen participants have been preparing diligently for their trip over the course of 12 intensive workshops that spanned two summers. These young ambassadors have participated in Japanese language workshops; organized a luncheon fundraiser for the trip; learned about Japanese culture; participated in a ropes course at Ft. Miley; and taken command of their own activities, planning elements of their own workshops and thereby building their leadership skills. The fellows have also had to apply the planning process to every activity and event, and as a result of the process they have learned the importance of setting goals, objectives, and understanding how each step in planning aids in reaching their goal. They have planned several intercultural activities in Kobe and a special activity in Kesennuma for Tohoku earthquake/tsunami survivors. They will also have the chance to visit the Nagata Kodomo Home (an orphanage) and go to Kisen Wai Wai Mura, where they will have the opportunity to experience traditional Japanese village life by harvesting vegetables, pounding mochi, and making their own chopsticks and slippers. Riki Eijima is a 15-year-old sophomore at Lowell High School in San Francisco. Tai Iwamasa is a 16-year-old junior at George Washington High School in San Francisco. Claire Nakamura is a 16-year-old junior at George Washington High School. Andrew Nielsen is an 18-year-old incoming freshman at UC Santa Cruz. Mika Osaki is a 16-year-old attending the College of San Mateo. Aislinn Ozawa-Burns is a 16-year-old junior at Ruth Asawa School of the Arts in San Francisco. Tae Shimamoto is a 17-year-old sophomore at Bishop O’Dowd High School in Oakland. Jessi Svoboda is a 17-year-old senior at Clayton Valley Charter High School in Concord. Kai Wong is a 15-year-old sophomore at Sacred Heart Prep High School in Atherton. Wesley Yee is a 17-year-old junior at Lowell High School. All participants who successfully complete the Takahashi Program will receive a certificate of completion, as well as personal letters or certificates of commendation from the Consulate General of Japan in San Francisc and members of the U.S. Senate, U.S. House of Representatives, California Senate and California Assembly. This trip would not be possible without the hard work and dedication of the ambassadors’ families in supporting their children these past 13 months and the generous support from The Henri and Tomoye Takahashi Charitable Foundation, Japan Airlines and Kintetsu International Travel. For more information on the program, contact Lori Matoba at the JCCCNC, (415) 567-5505, or visit www.jcccnc.org.